Apples are a great source of pectin, a soluble fibre which helps keep your heart healthy by lowering cholesterol and also keeps both blood sugar and appetite in good shape. An apple a day is a good way of adding disease fighting antioixdants to your diet. Studies have linked the plant compounds found in apples with lowered risk of heart disease, high blood pressure and cancer. Apples have a low glycemic index, making them a good choice for people with diabetes and people trying to watch their weight. A recent study, published in the British Medical Journal, suggests that consumption of whole fruits (not their juices), especially blueberries, grapes and apples, was associated with a lower risk of Type 2 diabetes. Apples have been called nature’s toothbrush because they stimulate your gums, increase saliva flow and reduce the build-up of cavity causing bacteria. 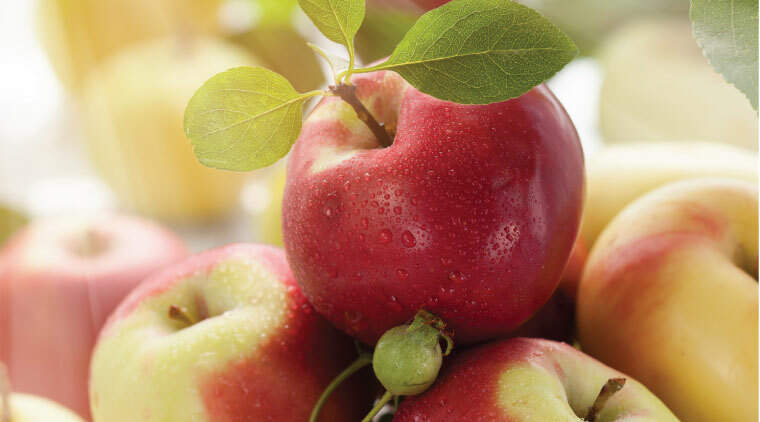 One apple has about 80 calories, making it a good choice for weight management. It’s best to eat the whole apple with its skin on to get the best benefits. I can easily eat an apple a day but also love apples in other ways. I chop them into my morning yogurt, like them in a salad or salsa and even sliced into a grilled cheese sandwich. For desserts, a baked apple, apple pie or crisp and of course, homemade applesauce are all delicious. Its apple picking season, and if you bring home a basket or two, properly stored, they will keep about 6 weeks. According to the Apple Growers of Ontario, cold, humid storage ensures that apples maintain their crispness, juicy texture and full flavour. They advise storing them in perforated plastic bags in your refrigerator crisper. Remove any fruit that are overripe or have soft spots because they naturally give off ethylene gas that will cause nearby apples to ripen too quickly and spoil. Trim and use these apples for pies or applesauce. The ethylene gas emitted by apples can also speed up ripening in other produce so its best to store apples separately from other fruits and vegetables.